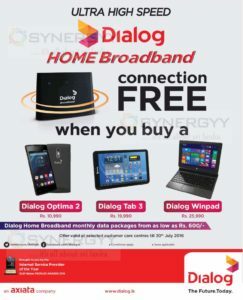 Dialog announces a special promotion of get Ultra High Speed Dialog Home Broadband for free when you buy a Dialog Optima 2 or Dialog Tab 3 or Dialog Winpad. Enjoy Dialog Home Broadband monthly data packages from as low as Rs. 600/- with your new purchases of Dialog Mobile products.